For those who love plants but are forced to live in an apartment, learning how to start an apartment garden offers the opportunity to indulge in your favorite hobby while living in a small apartment. If you have a bright, sunny window, you can start a garden easily. Even a north-facing apartment with limited light can be outfitted with plant lights, however, to create an indoor living space replete with flowers, herbs and even vegetables. While idea of a rooftop garden is enticing, most people must set their sights on something a bit more modest. Here are several types of apartment gardens for the average apartment dweller, and ideas to help you get started. 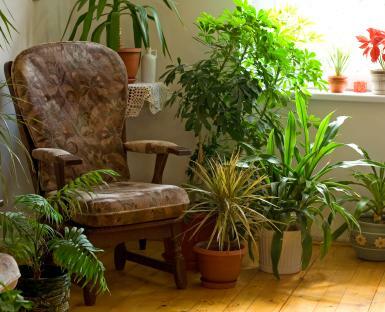 Choose plants that thrive indoors. Although growing orchids sounds like an exotic hobby, orchids are surprisingly hardy and do well in apartment settings if given the right light and moisture requirements. Other lovely indoor plants for color include African violets, which thrive in bright eastern or western windows, as well as flowering, scented plants such as gardenias and jasmine. You can arrange such plants on a tiered shelf or bookcase near your garden corner. Choose one large focal plant, perhaps an indoor evergreen or a large palm or bamboo. Place this next to your chair and use it to screen the plant lights if you are using a light stand. Add your houseplants, and you've created a gorgeous apartment garden full of flowering plants. Many apartment dwellers dreaming of growing vegetables don't realize vegetables can be grown in an apartment. Not every vegetable does well, of course, but you can grown lettuces indoors. If you have a balcony, so much the better; you can grow tomatoes, peppers, cucumbers, and even small fruits such as strawberries and melons. A balcony garden must receive plenty of bright, south, southeast or southwest light to thrive. Do not use your fire escape for a garden; blocking a fire escape with plants, while it looks charming in the movies, is a hazard to safety for you and possibly your neighbors. It's easier when learning how to start an apartment garden to purchase individual plants at a garden center to begin your apartment garden. Choose the largest, healthiest plants you can. Single pots of tomatoes, for example, offer you the taste of a homegrown tomato without worrying about what to do with the extras if you have limited space. Another option for apartment dwellers is to plant a kitchen windowsill herb garden. You can buy kits at the garden center which include a long, narrow tray that fits neatly on the windowsill, pots, soil and seeds. Or choose a single specimen plant, such as a rosemary trained into a basket or topiary shape, and enjoy that on your windowsill, snipping off bits as needed for culinary use. Herbs that do well on bright, sunny windowsills include basil, rosemary, chives, and dill. Be sure you have adequate light. Sometimes apartments are situated with just a small alley between buildings, and neighboring buildings can block the light to your balcony. Try growing plants inside using grow lights if you need supplement light. If you're dying to try some heirloom or exotic varieties that can only be grown from seed, organize a seed swap with other apartment dwelling gardeners. Share seeds and plants. You may just meet some new gardening friends and get to grow some interesting plants.